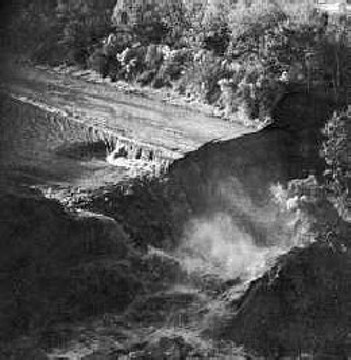 One afternoon in November 1980, placid, shallow Lake Peigneur in New Iberia, Louisiana changed first into a swirling whirpool of mud and then into a terrifying 150-foot waterfall. In only three hours, two-and-a-half billion gallons of fresh water disappeared into the salt dome below the lake. The fresh water washed away the salt as it went, creating a widening vortex that swallowed aquatic life, lakeside homes, and acres of land as well as most of Jefferson Island. This vortex was powerful enough to reverse the flow of the Delcambre canal connecting Lake Peigneur with the Gulf of Mexico’s Vermillion Bay. Fully-loaded barges were sucked out of the canal and into the whirlpool where they disappeared below ground. Over the next few days, water from the Gulf continued flowing upriver into Lake Peigneur, eventually replacing a 6-foot-deep body of fresh water with a pool of saltwater over a thousand feet deep. Drilling caused this disaster. The drill of a Texaco oil rig searching for tiny pockets of petroleum around the salt dome punctured tunnels dug inside the dome by the Diamond Crystal Salt Company. Miraculously, the dozens of miners working below the lake at the time escaped with their lives. Texaco blamed the subcontractor who’d been operating the rig, much as BP seeks to blame subcontractors for the 2010 destruction of the Gulf. Although it was clear what had happened, no “official” cause or explanation for the disaster was ever determined. The Diamond Crystal Salt Company got out of the mining business altogether, a process no doubt eased by a private $45 million settlement they got from Texaco and its drilling subcontractor– Texaco paid liberally to avoid an actual trial and any legal designation of blame. One local fisherman interviewed for a TV report on the disaster wore an “I survived Lake Peigneur” cap. After his near-death experience on the lake, he explained, he’d given up fishing; he now got his fish at a grocery store. Fishermen might have been scared off (and the freshwater fish killed), but in Louisiana no disaster is ever so daunting that the big boys of oil & gas won’t go back if there’s money to be made. After all, who’s going to stop them? So relentless is the quest for proft that in 1994, the remaining salt caverns below Lake Peigneur became home to JISH, Jefferson Island Storage & Hub, where empty areas of the vast salt dome are filled with billions of cubic feet of natural gas and 16 miles of pipelines. The current owner of JISH is Atlanta-based AGL Resources. While AGL is new-ish to natural gas storage, its engineering company, TKE, has experience; in 2002 TKE built salt dome natural gas storage in Moss Bluff, TX. In 2004, that facility exploded, prompting evacuation of a three-mile radius around the facility. Six billion cubic feet of natural gas burned for six days. The Napoleonville salt dome storage that created the Bayou Corne sinkhole didn’t just contain butane and natural gas. In 1995, the Louisiana Department of Natural Resources let Texas Brine “dispose” of radioactive material– a drilling byproduct called “scale”– by putting it into the Napoleonville dome and another cavern over in Lafourche Parish. As the sinkhole yawns ever wider, hundreds in Assumption Parish have already been evacuated, and many nearby have experienced health problems. Tests of the waterways around Bayou Corne now show signs of toxic contamination. • In 2009, in Desoto Parish, a one person was killed, several hospitalized (including first responders), and neighborhoods within a two mile radius of a fracking site were evacuated while a blowout spewed methane into the air. • A little farther north in Caddo Parish that same year, 19 cattle died of respiratory failure after drinking a “mysterious fluid” that was seeping near a fracking rig. • Less than a year later, hundreds were evacuated after another blowout contaminated the Caddo drinking water aquifer. Parish residents were denied any information about the specific contaminants, but were told even washing their clothes in the water from their faucets was dangerous. • On March 31, 2012, one worker was killed and another injured in Lafayette Parish by an explosion at a gas well run by fracking company Hilcorp… and the beat goes on. Storing oil and gas under salt domes isn’t a popular idea with the people of Louisiana just recently, but the people of Louisiana don’t get much say in these matters. Storing oil and gas in salt domes is profitable, so AGL is expanding its natural gas storage in the salt dome below Lake Peigneur. The original application to construct two additional storage caverns was stalled in 2006 when then-governor Blanco demanded an environmental study of the project, but the company responded with a lawsuit, which has now been settled. The expansion is rolling forward, and no environmental study of its possible effects will be required. On March 23, 2013, Louisiana’s Department of Natural Resources granted AGL the first permit of three the company will need to begin doubling capacity at JISH. Recently, there are worrying signs that the Jefferson Island salt dome beneath Lake Peigneur may not be stable. The lake has begun bubbling. According to Nara Crowley of the New Iberia group Save Lake Peigneur, the bubbling resembles “a pot of spaghetti water boiling over,” similar to the bubbling reported in Bayou Corne in spring 2012, a few months before the tremors hit and the sinkhole opened up there. He cited specific structural concerns, warned of a Bayou-Corne-like collapse, and explained, “the leaching of the two new salt caverns will yield a by-product called ‘brine,’ which is super-saturated salt water. AGL will pump the brine by-product through a disposal pipe into the sediment below the Chicot Aquifer. If there is breach in the disposal pipe (science proves that salt water corrodes metal) brine water could leak out into the Chicot Aquifer, contaminating the drinking water supply for our area. “An engineering miscalculation caused millions of dollars in damage that ill-fated day. Are we so complacent that we think this can never happen again? The cries of residents from Delcambre, New Iberia and along Lake Peigneur have fallen on deaf ears… I cannot express how distressed I am over the future of Lake Peigneur and the residents of Iberia Parish.” As of press time, the Governor’s office hadn’t bothered to respond. New Iberia’s state senator, Fred Mills, is another staunch opponent of the expansion. “This lake, this region, these resources have sacrificed enough,” he told Louisiana’s Department of Natural Resources, roughly a month before they approved the first permit. The protests of residents, politicians, law enforcement, a Delcambre city resolution signed by the mayor, the unanimous opposition of the Iberia Parish Council and the water-quality concerns of the director of the local utility company… all mean nothing. When the energy industry wants something in Louisiana, it becomes clear who really holds the cards. According to Senator Mills and others, the drinking water around Lake Peigneur has become worse every year since the salt dome storage began; once among the cleanest in the nation, it now requires extensive chemical treatment. Arsenic levels are steadily rising. So, whether or not Lake Peigneur experiences another spectacular, news-making collapse, people in Assumption, Iberia and St. Martin parishes are already being poisoned. In a late 2012 interview, Mills pulled no punches when discussing the effects of the oil and gas industry on Cajun country. ”This is genocide,” he said.